Is there any way of programming the "Right-click" + "Move To" function so that there is a drill-down into the folder hierarchy? It's already there. Each account is listed in the dialogue displayed by that context menu path. Are you not seeing the account names now? @DanRaisch, I'm not sure what you mean by "dialogue displayed by that context menu path". To explain further: First note that I have several accounts. When I use right-click & Move To, I see several Inbox folders, a couple of Drafts folders, a cople of Sent folders, and then some random subfolders that I have. There is no pattern. And there is no way to view all folders. Actually I don't want to see Inboxes/Drafts/Sent Items/Subfolders from other accounts when I'm in one account. Are you using the Global Inbox option with POP type accounts? Each of the right facing arrows in the image below expands the selections (as shown) to the next level. 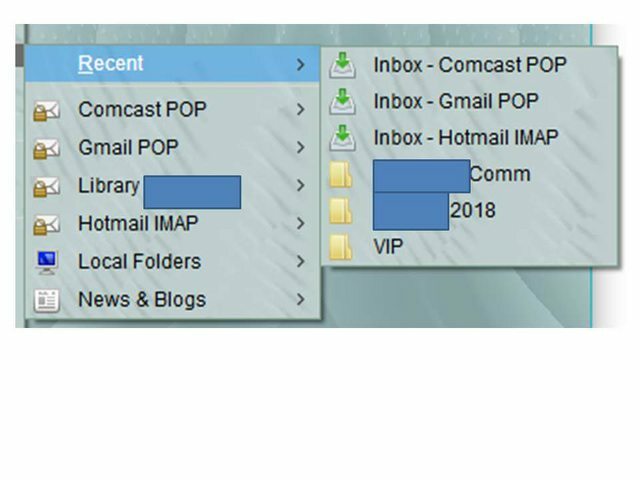 That is, clicking on "Gmail POP" in that left hand panel would open a box to the right (as shown for Recent) to make the folders of that account visible for selection. No. I am using IMAP. I don't get the arrows or Recent option. I actually disabled an Appearance theme but this had no effect. So I had this theme (TT DeepDark), and other add-ons including Folder Pane Switcher, Lightning, Manually sort folders, Quick Folder Move and Toolbar Buttons. PS. It looks like it was the Quick Folder Move add-on, so I removed it.